Download the Boyne Highlands Resort mobile app to enhance your experience. Mobile apps contain many features like scorecard, GPS, tee times, news, deals and more! Click on the icons for more information and free download. BOYNE's very first course, The Heather, has stood the test of time as an elite, best of the best, championship course. Bearing all the markings of its legendary designer, this Robert Trent Jones, Sr. course has tested the finest names in the game since 1966, playing host to Michigan Amateurs, AJGA Championships, the Michigan State Pro-Am, and The Celebrity Tour. Its wonderful test of golf combined with some of the most premier playing conditions in the mid-west is why the Golf Association of Michigan has selected The Heather as the host site for the 100th Michigan Amateur in 2011. A signature course that lives up to the legendary reputation of its namesake, the Arthur Hills course is widely recognized as one of the finest in Michigan - and a bucket list essential for avid golfers, both regionally and throughout the United States. With its wide, bunker-dotted fairways, narrowing approaches, and fascinating greens, this scenic course provides excellent playability for golfers of all levels. The course was showcased on Big Break X: Michigan, the Golf Channel's popular golf travelogue. Widely regarded as a members' favorite, The Moor represents a fair but true test of game. The difference lies in the doglegs. Designed with numerous twists and turns, the front nine of The Moor favors right-handed power fade hitters. It's reputation is so widely known that The moor has been designated as an AJGA Championship course. Featuring all new tour bunker sand, The Moor is one of BOYNE's most versatile, perfect for 9 or 18 holes. By Design, the Donald Ross Memorial plays like a history of championship golf. Comprised of a selection of the greatest holes ever designed by one of the sport's greatest course designers, the Donald Ross Memorial is the golfing equivalent of a "greatest hits" compilation. In a single round of golf, players experience the history and heritage of 3 Ryder Cups, 8 U.S. Amateurs, 11 PGA Championships, and 14 U.S. Opens. You'll find holes replicated from some of the most renowned courses including Oakland Hills, Seminole Golf Club, Pinehurst #2, Inverness, and Oak Hill. From I-75: I-75 to exit 310 to M-68 W about 11 miles to US 31 S to Conway, go right at blinker. At M-119 turn right & watch for sign before going right to area. From US-131: US-131 north to Petoskey, continue onto US-31 N/Bay View Rd, turn left onto M-119 N, then watch for & follow signs into the resort. Estimated drive time in minutes to other BOYNE properties: Boyne Mountain Resort (45), Crooked Tree Golf Club (30), Bay Harbor Golf Club (35), Hidden River Golf & Casting Club (20). Resort lodging guests are encouraged to book tee times at the time you book your golf package. 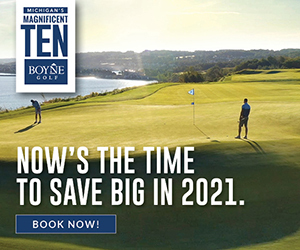 Guests not staying at BOYNE can book reservations any time during the current calendar year and are encouraged to reserve early for the best possible rates. Tee times can be booked online or by calling our team of Vacation Planners. * Cart fees only. No greens fees at eight Michigan BOYNE golf courses including Hidden River Golf and Casting Club. Contact Boyne Highlands Resort at 855-839-2272 for more information and details on holding a golf outing at the course. With three spectacular settings to choose from - and award-winning spas - our northern Michigan resorts are natural destinations for weddings, social gatherings and special events. Whether you're contemplating a no-holds-barred wedding venue, a lively venue for a family reunion, or the perfect place to spend your honeymoon, Boyne Highlands Resort, Boyne Mountain Resort and The Inn at Bay Harbor have the facilities and amenities you need to make the most of your event. For wedding options call (855) 839-2272. Boyne Highlands boasts a variety of the finest northern Michigan lodging options. 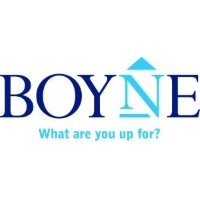 Whether you are looking for a townhouse or hotel rooms right on the slopes to fit a large group or you want a more secluded Alpine Village room, you will find what you are looking for here at Boyne Highlands. For lodging options available at Boyne Highlands please visit https://www.boynehighlands.com/lodging or call (855) 839-2272. Boyne Highlands Resort offers numerous dining options to suit the tastes of everyone. From the traditional dining experience found in the Main Dining Room, to a Country Club setting at the Seninole Pub, it can all be found here at Boyne Highlands Resort. For available dining options at Boyne Highlands Resort please visit https://www.boynehighlands.com/dining or call (855) 839-2272. Experience our newest addition to the Boyne Spas' family! Find your tranquility while enjoying therapeutic services, our indoor/outdoor pool, sauna, fitness room, relaxation lounge, and spa boutique. The Spa is located on the lower level of the resort's Heather Highlands Inn. The facility is available to guests of the resort, homeowners, club members and area residents. We hope you are excited about this expansion of experiences offered at Boyne Highlands Resort! Please visit https://www.boynehighlands.com/the-spa-at-boyne-highlands or call (855) 839-2272 for additional information. This profile was last updated on 08/07/2018 and has been viewed 18,055 times.